Are you a bit overweight or obese? Are you searching for ways to lose weight or body fat? Are you interested in understanding what is causing you to gain weight? Do you have belly fat or upper body weight that you are trying to lose? If you answered yes to any of the above questions, you are not alone. As a fellowship trained obesity medicine physician, let me review proven and effective ways to lose weight. No matter what anybody might tell you – there are about 5 proven ways to lose weight. Weight-loss bariatric surgery which shrinks the stomach and forces you to have a Low Calorie Diet (number 1 or number 2). Since the stomach can re-expand after a couple of years, and given the complications, risks of surgery etc., bariatric surgery for weight loss is not for every body. Let us look at each of these weight loss options and how to combine different options such as VLCD or LCD with a weight loss medication, with a little bit of exercise for optimal and fast weight loss. What is Very Low Calorie Diet? A very low-calorie diet (VLCD) is not just any diet that is low in calories. 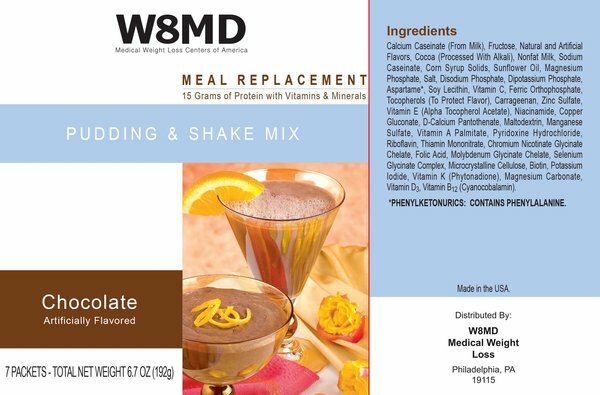 It is a special type of diet that replaces all of your meals with prepared formulas, often in the form of liquid shakes such as the W8MD’s Meal Replacement shakes, smoothies, bars, and other weight loss meal replacement supplements. Do not go on a VLCD on your own. If you need to lose weight, talk a weight loss doctor about the approaches that may work best for you. What is VLCD or Very Low Calorie Diet? A very low-calorie diet (VLCD) is not just any diet that is low in calories, usually around 800 calories under careful medical supervision. It is a special type of diet that replaces all or most of your meals with prepared formulas, often in the form of liquid shakes. A VLCD may be used for a short time to promote quick weight loss among some people who are considered to be obese. The diet requires close care from your doctor and is usually combined with other ways to lose weight. 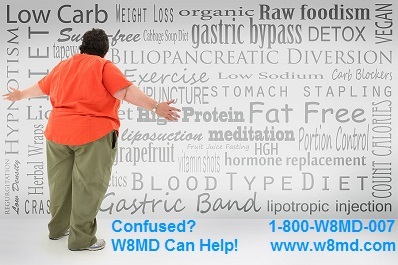 If you need to lose weight, and have health insurance, you may want to consider your nearest W8MD Medical Weight Loss Center’s Program. If you do not have a W8MD center near you, talk to your doctor and see if they have an interest in adding a W8MD Insurance Physician Weight Loss Program Franchise at their office with no large startup costs. The number of calories may be adjusted based on your age, weight, and how active you are. An LCD usually consists of regular foods, but could also include meal replacements. What is Modified LCD and Modified VLCD Diet? At W8MD Medical Weight Loss Centers, we offer modified LCD and VLCD diets with 1-2 or your own meals prepared with written detailed instructions from us along with 3-5 of the very low calorie partial meal replacement weigtht loss smoothies, bars, shakes, soups etc. This VLCD or LCD diet is usually combined with a weight loss prescription medication such as Phentermine, Topiramate (like in the new weight loss drug Qsymia) or other medications when appropriate, along with exercise instructions for optimal weight loss. While exercise is important, it alone is not very useful as a tool to lose weight unless it is combined with a calorie restricted diet. See these articles on why exercise won’t make you thin from Time Magazine. According to Dr. Eric Ravussin, Chair of diabetes and metabolism at Louisiana State University, as reported on this time article, exercise alone is pretty useless as a tool for weight loss. This is because exercise makes you hungrier and also builds heavier muscle thereby compensating for any calories burnt. This is a well established fact in the field of Obesity Medicine that exercise alone is not enough for weight loss and almost useless as a tool for weight loss. Even Bally’s fitness acknowledges this and put it on their website. Shoud I consider Medical Weight Loss Or Bariatric Surgery? Bariatric surgery is an option for some people. If you look at what this surgery does, it is similar to LCD or VLCD in the fact that bariatric surgery is artificially making your stomach small so you are forced to eat an LCD or VLCD diet which you might do on your own. For most people, a non surgical approach with VLCD or LCD in combination with weight loss medications, and some exercise is the only proven way to go for long term weight loss success although surgery is an option for a minority of patients. How can W8MD Medical Weight Loss Centers insurance weight loss program help? We can help you achieve long-lasting weight loss without feeling constantly hungry and deprived. When you resent your weight loss plan because you feel constantly hungry, it is much more difficult to maintain any significant lifelong changes. When you feel hungry, it is a bit late as your body thinks you are starving. The best strategy is to eat preventively with a very low calorie meals of about 200 calories or so using VLCD or LCD as noted above. At W8MD Medical Weight Loss Program, we want to help you achieve lasting weight loss results and make changes that will keep you healthy for a lifetime. Dr. Prab R. Tumpati is a highly trained and respected physician with training in Obesity Medicine, in addition to being board certified in Internal Medicine and Sleep Medicine, and is well versed in the medical treatment of overweight and obesity. Dr. Tumpati oversees all our patients and helps customize their individual weight loss treatments. We are committed to helping you lose weight as safely and efficiently as possible. Start with a knowing where you are with a body mass index calculator, a measuring tape, a copy of the last blood work, if have any and understand where you stand. Check your BMI using an online BMI calculator. Go to http://www.w8md.com and find the BMI calculator on the right side of the page, put in your information, and find out your BMI. Check if you meet the criteria for metabolic syndrome. Go to http://w8md.com/w8d-healthy-living/w8md-metabolic-syndrome-meter and see if you meet the criteria for metabolic syndrome. Consult with an Obesity Medicine Trained Physician knowledgeable about metabolic syndrome, insulin resistance, and other causes for weight gain and can help you lose weight safely and effectively using evidence based methods. Start walking or other low to moderate intensity exercise program. Understand that exercise alone is useless for weight loss but in combination with a reduced calorie diet, it helps. Start a behavior change plan to help you stay on track with your goals. If you have 10 pounds to lose or 100 or more pounds, you may want to consult a trained Obesity Medicine Physician that can do a thorough assessment of your situation and present the best option that suits your situation. The good news is that W8MD medical weight loss can accept health insurance for the weight loss physician visits so you can lose weight fast, and safe and your insurance will most likely pay for the visits! Our farthest patient comes from Nassau, Bahamas! Testimonials! W8MD medical weight loss program at Vida Sleep Center of Dr. Felix Roque’s office at 543, 45th Street, Union City, New Jersey. 543 45th St, Union City, NJ 07087. Posted on May 29, 2013, in Diet, Diet For Weight Loss, New York City Weight Loss Center, qsymia, Very Low Calorie Diet, VLCD, Weight Loss Articles, Weight Loss Center Contacts, Weight Loss Center Locations, Weight loss NYC, Weight Loss Supplements and tagged Eric Ravussin, how to lose belly fat, how to lose fat, how to lose weight fast, Insurances Accepted For Weight Loss, King Of Prussia Weight Loss, Meal Replacement, Obesity, Philadelphia Weight Loss Center, Prab Tumpati, Weight Loss Articles. Bookmark the permalink. 12 Comments.